Will the Earth ever be free of the giant insect alien menace of the purposefully-schlock Earth Defence Force series? God, I hope not. D3Publisher just made Earth Defence Force 5 for the PlayStation 4 official. It has a giant frog soldier in it. A guilty pleasure to those who play it and an ugly mess to those who don't, the Earth Defence Force series started life as a throwaway budget title for the Japanese PlayStation 2 and... well, I was going to say grew into something much better, but not really. Over the course of multiple games spanning multiple hardware generations, it's pretty much stayed the same. The animations are horrible, the voice acting is the worst and the gunplay is sloppy, but somehow it all comes together into the perfect B-movie gaming experience. 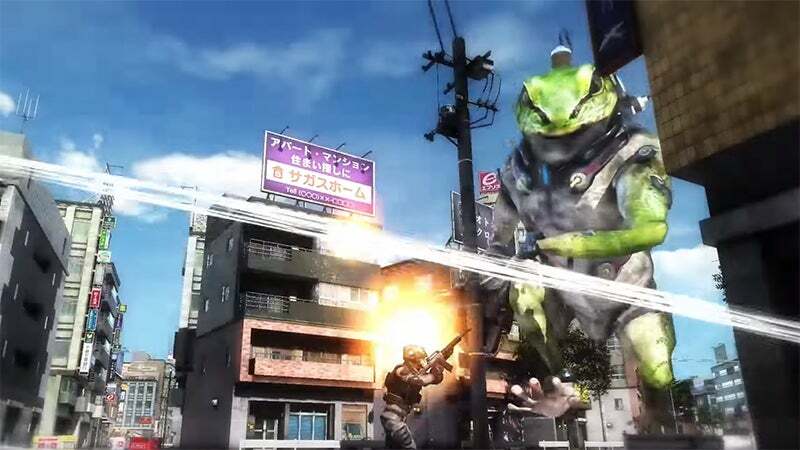 Teased by D3Publisher earlier this month, Earth Defence Force 5 continues the grand tradition on Japanese PlayStation 4 next year. At this point I imagine the developers have to actively work to make games so horrible that they're great. I hope it has splitscreen, my wife and I love playing these games together on the couch. There's nothing guilty about my pleasure of EDF. It's one of the most fun coop experiences I've ever had. I always feel articles on it undersell it a lot. There's an absolute joy in flying around as wing diver, tearing up into the sky with your jetpack, screaming out the EDF anthem to your coop buddies to have them shout out the next lines, almost running out of fuel on a suicide mission to take out a giant alien dropship spitting out ants and giant robots. Then you just manage to drop it with your laser lance, plummet back to earth, bunny hopping to avoid enemies as you wait for the jetpack to recharge. I made a video of my experiences. It's not very good, it's too long and it's got terrible music. But it's so fun. we'll unleash all our forces we wont cut them any slack! Terrible gunplay? The gunplay works fine. EDF 4.1 on the PC has been one of the most fun experiences to have with friends or pubs that I've had in a long time. No rivalry, no acerbic tween fuckhole screwing you over just to troll you, just you and three friends against thousands upon thousands of evil bugs, in real time, with bombastic gameplay. Here's hoping it sold well enough to warrant a PC release of 5 as well - EDF has been the greatest 2P co-op experience when I catch up with a mate! The only real additions we've hoped for are 4P splitscreen, bringing back online splitscreen, and [most importantly] recording song lines for the Wing Divers.